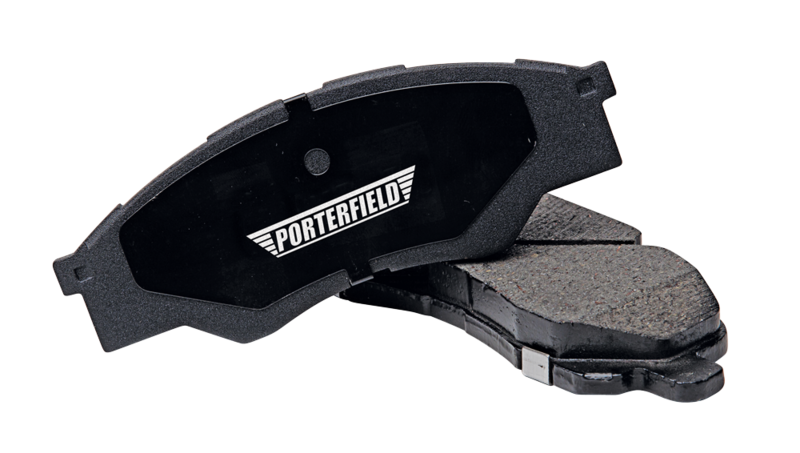 Porterfield brake pads, with race proven performance! Available for all brake applications in various compounds to suit race track, rally, clubsport and high performance street use. Designed specifically for heavy-duty motorsports. The carbon based semi-metallic R-4 materials allow the pad to absorb tremendous amounts of heat and dissipate it at a very even rate. Carbon kevlar material warms up to race temperature quickly, which is quite helpful during restarts and when track time is limited. When used with cast iron and steel alloy rotors, the R-4 compound requires minimal bed-in period. Throughout the entire heat range, the carbon kevlar material will give extremely consistent modulation and predictability. This is truly the most rotor friendly racing brake pad material ever. Good for road courses, track, rally, vintage racing, autocross, club events or professional racing events. A carbon kelvar compound made to last a bit longer than the original R-4 compound. The R4-E compound is designed to endure higher prolonged temperature and still has pad life as long or longer than the R-4. This pad is great for enduro events and applications where temperatures are at their maximum. Developed using knowledge tested on the vintage racing community. Optimum uses for the R4-1, under conditions where very high friction is needed with minimal warm up time and in applications where there is difficulty in maintaining sufficient heat with conventional race pad compounds. Widely used on vintage GT and formula cars, the R4-1 is also gaining popularity in off road and rally cross classes. Great modulation, consistent pedal feedback and rotor friendly at all temperatures. For high performance and heavy-duty street conditions. Perfect for prolonged everyday street use while also being capable of tolerating the most severe street use without fade. Rotor friendly. The R4-S friction level will give you an impressive increase in stopping ability and with minimal pedal effort. The R4-S compound has the absolute lowest noise and dust levels, far below OEM equipment or any other high performance brake material. Good for autocross, solo events, club events and high performance street. We have a full range of Porterfield brake pads in stock, manufactured with various compounds, with different heat ratings to suit most vehicles for street, race and endurance applications.